Jack Back returns with another thunderous and self-assured release. In 2018 he made waves in the industry with his debut Defected release ‘(It Happens) Sometimes’, soaring to the top of the Beatport and Traxsource charts, as well as achieving #1 on the USA Billboard Dance Chart. Now he returns with a DFTD debut ready to set dancefloors alight, fitting in seamlessly with the catalogue of club-focussed tracks the label has curated. Title track ‘Survivor’ with its tension-building drops and a heavy bassline is a rough-and-ready club track prepared to get the room moving, it also may ring familiar with R’n’B fans. ‘Put Your Phone Down (Low)’ follows in the same club-oriented vein with a little more intensity, making for a release with real club pedigree. 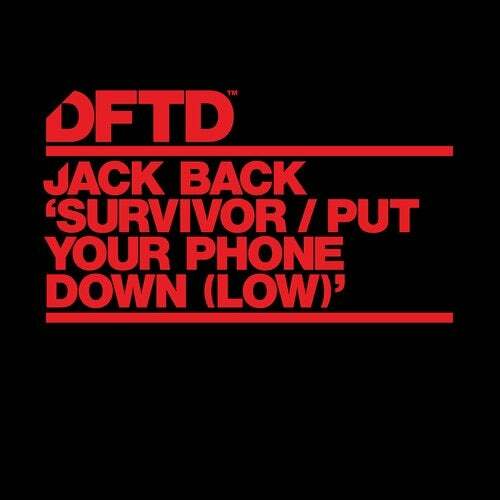 Jack Back 'Survivor / Put Your Phone Down (Low)' 1. Survivor (Extended Mix) Written by Beyonce Knowles, Matthew Knowles & Anthony Dent Produced by David Guetta & Timofey Reznikov Vocals by Francesca Richard Published by Beyonce Publishing/Warner/Chappell North America Limited, Hitco South/BMG Rights Management (UK) Limited, For Chase Muzic Inc/BMG Rights Management (UK) Limited & M W E Publishing/Memory Lane Music Ltd 2. Put Your Phone Down (Low) (Extended Mix) Written by David Guetta, Timofey Reznikov, Rachel Keen & Janee ?Jin Jin? Bennett Produced by David Guetta & Timofey Reznikov Vocals by Raye Published by JackBack Publishing Ltd admin by Write Here Music (SACEM) & Shapiro Bernstein (ASCAP), Warner/Chappell (BMI), Universal Music Publishing Ltd & Copyright Control P&C 2019 Defected Records Limited dba DFTD under exclusive license from What A Music Ltd & Warner Music France S.A.